The back of the eye is full of a clear gel-like substance called vitreous. With age, the vitreous gel begins to liquefy and shrink. As the vitreous liquefies, condensations form in the vitreous that appear in your vision as small dark moving spots or “floaters”. Often times, patients will experience an episode where suddenly they have a few new large floaters that may be accompanied by flashing lights. These “flashes” are usually very brief and located in the peripheral vision. These episodes occur because the vitreous is shrinking and pulling away from the back inner lining of the eye, or the retina. 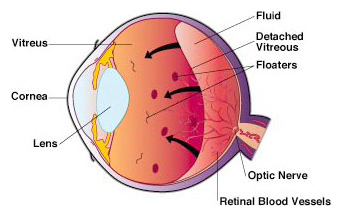 The floaters come from condensations where the vitreous was more tightly attached to the retina. The flashes are caused by the pulling on the retina by the shrinking vitreous. This condition is called a Posterior Vitreous Detachment (PVD) and it is not vision threatening. This is a very common condition and the symptoms can be annoying but will usually subside over the course of a few weeks or months. No treatment is indicated for this condition. The initial symptoms of a PVD may be very similar to those of a retinal tear or a retinal detachment. 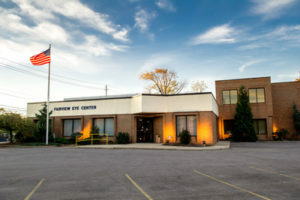 Therefore, it is recommended that you be seen by an eye care specialist at the onset of these symptoms to rule out anything more serious requiring treatment. Even following the diagnosis of a PVD, you should call to be seen by an eye doctor urgently if your symptoms become worse with the sudden onset of more floaters and flashes.